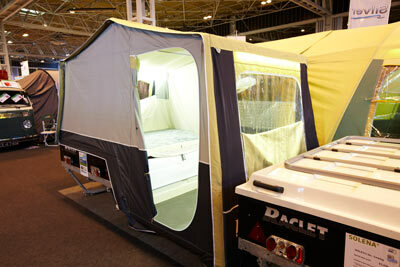 Trailer Tents for Under £3750! 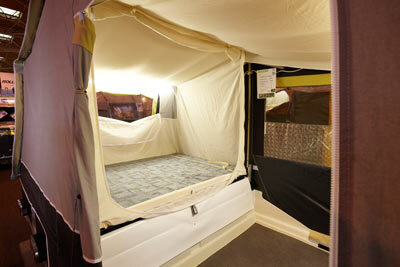 This month we compare two budget trailer tents to see which is the best value for money. The Raclet Solena is a budget trailer tent that uses almost identical trailer and frame technology to its more expensive siblings in the Raclet range, albeit in a much more compact package. This ‘no frills approach means it’s lightning quick to erect: simply unclip the trailer fasteners, open up the trailer, and pull the tent section up and over to form a simple bedroom and compact living area. There are no mod cons such as a kitchen or toilet area, but for those who need more space, an awning can be attached to the living space to create more living space – enough to accommodate a family of four at a pinch – although this significantly increases the set-up time from under five minutes to something like half an hour. The awning costs an extra £575 while a bedroom extension adds a further £356 to the price. Like most of the Raclet range, the Solena can be stored on its side in your garage on a special wheeled bracket (a £152 option) or even at the bottom of the garden and it’s simply a doddle to tow and manoeuvre on site. The Solena’s greatest strength is its simplicity, making it ideal for couples who just want a bed for the night before moving on to explore pastures new in the morning. 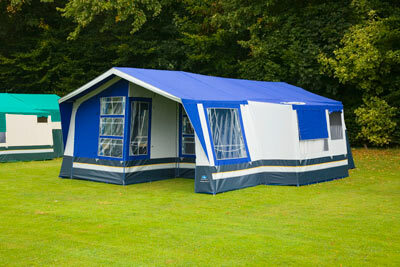 Insurance cost from £59 without extra awnings, or £71 with awning and bedroom extension*. If square feet of space per pound of outlay is the prime consideration, this huge trailer tent from SunnCamp takes an awful lot of beating. The 400S is an updated version, featuring low-maintenance acrylic fabric instead of the more conventional cotton. Unlike cotton, which will start to mould almost immediately if packed away damp, Acrylic dries more quickly and is significantly less prone to mould, so you can pack it away wet and dry it out later when you get home. The Holiday 400 is a colossal, family-friendly tent, with a huge 26 m2 footprint and four elevated sleeping berths with the option of adding more, making it ideal for large families. There’s a well-ventilated, dedicated kitchen area and the porch configuration can be re-arranged, converting into a sun canopy if desired. It’s all very well ventilated, which is important in acrylic tents as they tend to retain heat, and has mesh screens at the windows to keep out the bugs. While there’s no shortage of space, standard equipment is pretty basic, although a portable kitchen can be added for an additional £500. It’s also quite time-consuming to erect, taking two people around 45 minutes, but once it’s up, there’s ample room for the whole family to stretch out and relax – even if the weather outside is less than ideal. Insurance premiums from £59 with or without the kitchen extension*. 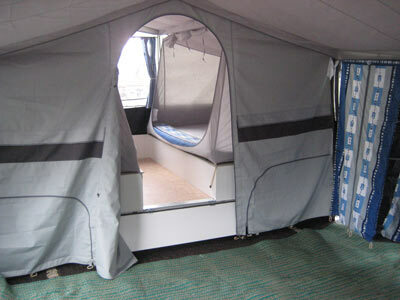 Both these trailer tents get top marks for affordability, but they offer quite different levels of accommodation. If size matters above everything else, then the SunnCamp is the best bet, but if flexibility and storability are more important considerations, we’d have to go for the Raclet, which can expand to meet the needs of a growing family. * Trailer tent insurance premiums based on 2010 Raclet valued at £3145, awning valued at £575 and bedroom extension valued at £356; 2010 SunnCamp Holiday 400S valued at £2445 and kitchen extension valued at £500. Fitted with a hitchlock and wheel clamp and kept in a locked garage at HX4 0BE. Trailer tent owners over 30 years old, camping for over 3 years claim free and members of a camping club. Premium includes 10% online discount where applicable and Insurance Premium Tax at 5%. Correct as of 16.06.10.